CSKA Moscow remained undefeated in Top 16 Group E by downing Zalgiris Kaunas 73-87 in front of a sellout crowd of 15,799 at Zalgirio Arena on Thursday. 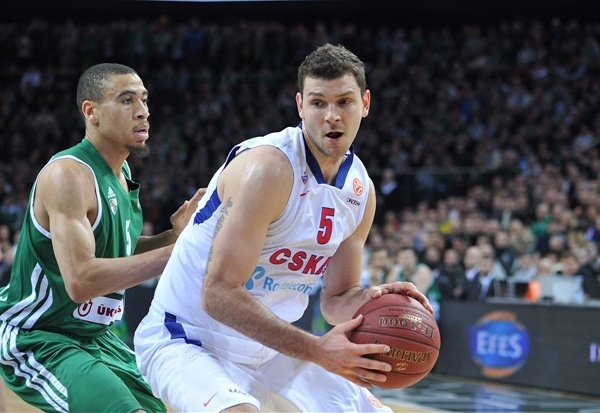 CSKA improved to 4-0 in Group E, grabbed its ninth consecutive win in the 2012-13 Turkish Airlines Euroleague and held on to a tie for first place with Real Madrid. Zalgiris dropped to 1-3 and registered its second home loss this season. Milos Teodosic paced the winners with 24 points and 5 assists. 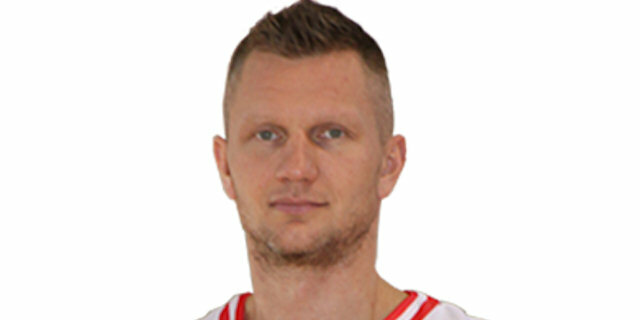 Vladimir Micov added 20 points and Viktor Khryapa had 15 points, 6 rebounds, 8 assists, 4 steals and 2 blocks for the winners. 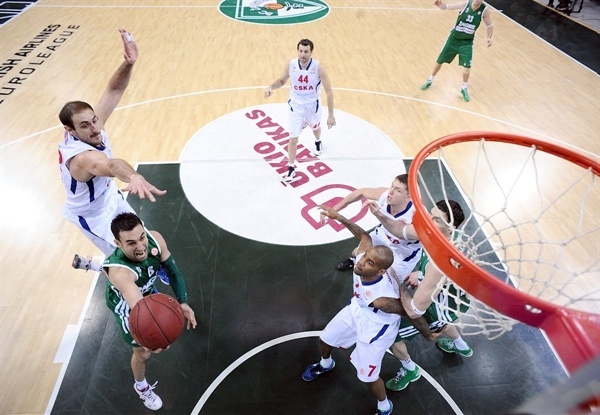 Marko Popovic led Zalgiris with 16 points. Tremmell Darden added 12, Oliver Lafayette 11 and Ibby Jaaber 10 for the hosts. Teodosic led CSKA in a 2-9 opening run, but Rimantas Kaukenas and Popovic brought Zalgiris within 15-16 at the end of the first quarter. Popovic kept pushing Zalgiris and a layup by Ksistof Lavrinovic gave the hosts a 22-18 lead. It didn't last long, as Khryapa started to dominate at both ends, getting help from Teodosic and Nenad Krstic to give CSKA a 31-38 margin at halftime. Teodosic and Khryapa led CSKA after the break, as the guests buried 6 third-quarter three-pointers to break the game open, 51-65, after 30 minutes. Nothing changed from that moment, as CSKA kept full control of the game until the final buzzer. Micov got CSKA going with a five-meter jumper and Teodosic sent a behind-the-back assists to Khryapa, who downed a mid-range shot for a 0-4 lead. Kaukenas stepped up with a driving basket for the hosts. 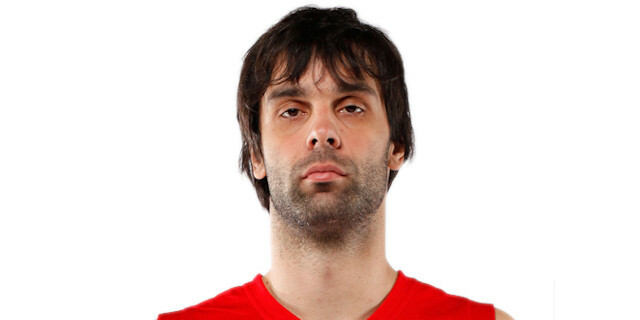 Teodosic followed a second-chance triple with an acrobatic basket to boost CSKA's lead to 2-9. Tremmell Darden downed a stop-and-pop jumper that Dionte Christmas improved on with a three-pointer from the corner. Kaukenas pushed Zalgiris with a jump hook and Jaaber hit from downtown to get the crowd involved at 9-11. Sasha Kaun split free throws and a driving layup by Teodosic gave CSKA some fresh air at 9-14. Mario Delas shined with a big block on Nenad Krstic and a two-handed slam. Popovic downed an off-balance shot that Krstic erased with a driving layup. 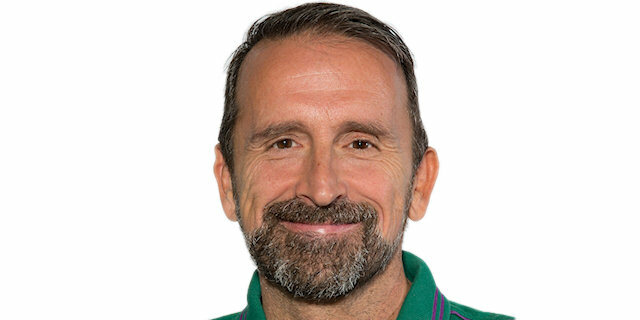 Popovic beat the buzzer with a wild driving basket that ignited the crowd and brought Zalgiris within 15-16 after 10 minutes. Oliver Lafayette hit a close shot to give Zalgiris its first lead, 17-16, early in the second quarter. Krstic swished a turnaround jumper that a red-hot Popovic answered from downtown to put the hosts back ahead, 20-18. Ksistof Lavrinovic shined with a put-back layup. Teodosic hit a floating layup, as CSKA tried twin point guards with Aaron Jackson guarding Popovic. Khryapa sank his trademark baseline jumper to tie the game again, 22-22. Jackson took over with a fast break layup that Vytenis Lipkevicius bettered with a triple. Kaun split foul shots. Paulius Jankunas found his first points and a catch-and-shoot three-pointer, but Khryapa restored a 27-28 CSKA lead. Darden nailed a mid-range shot, but an unstoppable Khryapa struck again from downtown. Jankunas scored around the basket before back-to-back jumpers by Krstic and Khryapa gave CSKA a 31-35 margin. Teodosic sank a three-pointer in transition to boost CSKA's lead to 31-38 at halftime. Ksistof Lavrinovic scored down low immediately after the break, but Micov matched that with a six-meter jumper. Kaun dunked to cap a 2-12 CSKA run and make it a 9-point game. Ksistof Lavrinovic split free throws, which an unstoppable Khryapa improved on with a three-pointer from the top of the key. Popovic answered from way downtown, but a three-pointer by Teodosic forced Coach Joan Plaza to call timeout at 37-48. Darden tried to change things with free throws, but Teodosic buried another one from beyond the arc and free throws by Micov broke the game open at 39-53. Lafayette stepped up with a basket-plus-foul and exchanged three-pointers with Micov for a 45-56 score. Delas hit a turnaround jumper, as Zalgiris switched back to a 2-3 zone defense. Christmas punished it with a triple, but Lafayette answered in the same way. Micov took over with another corner triple and free throws by Delas and Theo Papaloukas fixed the score at 51-65 after three quarters. Teodosic nailed a mid-range jumper early in the fourth quarter and a fast break dunk by Jackson sealed the outcome, 51-69, with over eight minutes to go. 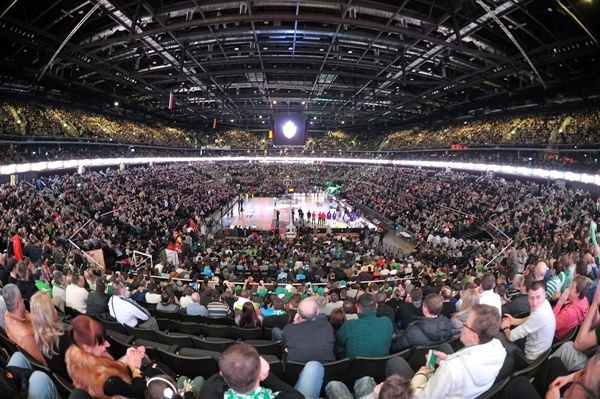 Zalgiris kept trying, however, pushed by an incredible crowd. Darden shined with a backdoor slam, as CSKA kpet using long possessions to run the game clock down. Darjus Lavrinovic and Darden free throws to get the hosts a bit closer, 56-69, with six minutes left. Sonny Weems scored down low and another three-pointer by Micov boosted CSKA's lead to 56-74. Zalgiris found a go-to guy in Jaaber, who made free throws, buried a three-pointer and added an acrobatic basket off a steal to force CSKA to call timeout, 64-74, with 3:28 to go. Kaun dunked and by the time Micov shined with a reverse layup, everything was said and done already. "I want to congratulate CSKA, who played better than us today. We made too many mistakes against such a powerful opponent. We should have in mind that we were the first team to beat CSKA this season in October, so they came out tonight very aggressive and concentrated. We can’t say that we weren’t fighting, but our efforts weren’t enough, we didn’t have the control tonight. We shot 44% from outside and any coach would like this percentage, but our opponents shot 60%. You can try any style of defense, but if they shoot like that it is very hard to compete. However I can say that CSKA will probably win most of their games on the road, so we shouldn’t stress too much and we should prepare normally for the next games." "After the game I thanked our players for very solid game. We played very good in both offense and defense against a team, which is a contender to be in the playoffs or even the Final Four. The key to the win was our ability to control defensive rebounds. We also managed to avoid their full court pressure. Even if statistics show our 16 turnovers, they weren’t crucial. Also in defense we managed to stop their pick-and-pop game, which was a very successful part of Zalgiris’s game so far. We are 4-0, but there are 10 more games in front of us. It’s still a long road. Also I want to dedicate this victory for Alexander Gomelskiy, whose birthday is tomorrow. He was very special person for us, for the fans and for the club." "They played very good. We had too many problems in defense, which allowed them to get into rhythm and to make open shots. We tried to pressure them, but we couldn’t find the rhythm ourselves. When you don’t have it, it’s very difficult to play at this level. CSKA lost only three games this season, so when you don’t create well enough in offense you don’t have many chances. We have to learn from our mistakes and look positively to the future." "We knew that Zalgiris plays very hard in defense, so we were ready for this. Also our team prepared to play very hard in defense too and we became one serious team. And for us it is very important that we won not at home, but here in Kaunas on the road. We now have a 4-0 record, but nothing is finished yet. We still have a lot of games in front of us. We came here to win and to play hard;, we knew that this would be a very important game for Zalgiris too. And the most important thing for us now is that we won. When we played the last game against Zalgiris in the VTB United League, we were a different team, because it was the start of season, but now we are much stronger. And now we play how we have to play."